"Kühlerschlauch, SBM, unten bis 69"
Hose End 1: 1 1/2 in. Hose End 2: 1 1/2 in. Keep your ride cool and running right with Dayco molded radiator hoses. 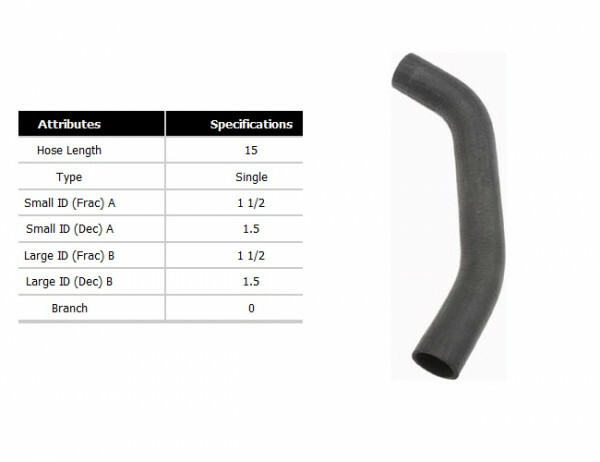 These Dayco molded radiator hoses are designed to replace your OEM hoses. They feature knitted reinforcement and all-synthetic EPDM construction to provide high strength and resistance to oil, mud, salt, road debris, ozone, coolants, and temperature variations of -40 to 257 degrees F. The inner base tube of these hoses is reinforced with knitted rayon for maximum strength and burst resistance for the life of the hoses.